Chlorpyrifos (CPS) is a toxic pesticide present in several pesticide formulations, with low degradability by natural processes. The degradation leads to the toxic metabolite chlorpyrifos-oxon (CPO). The analytical techniques used for the CPS and CPO analysis, like UPLC-PDA and GC-MS, are accurate but also expensive and time consuming, and they need sample pretreatment. 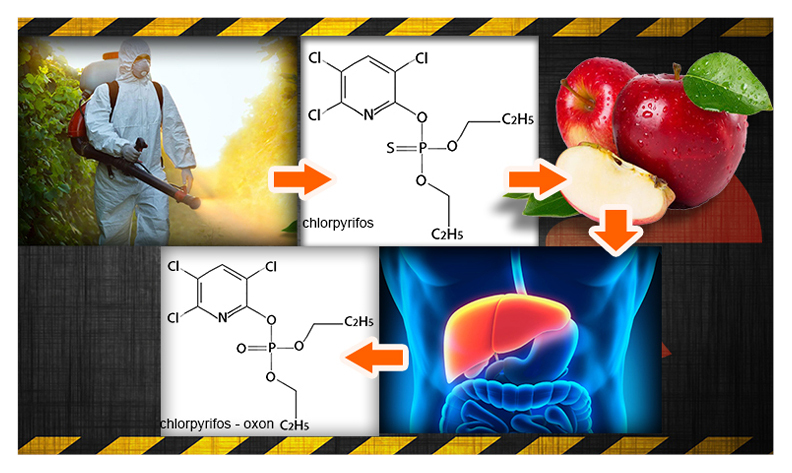 In the search of a more rapid and simple analytical procedure, atmospheric solids analysis probe with mass spectrometry (ASAP-MS) was optimized for the determination of CPS and CPO in apples (Malus domestica „Idared”). The identification of the analytes was based on protonated ion and isotopic pattern, while the quantification was based on peak intensities. The obtained results were confirmed by re-validated UPLC-PDA and GC-MS techniques. CPS and CPO concentrations determined by ASAP-MS and UPLC-PDA showed moderate discrepancies (on average by 10-20%), thus demonstrating that ASAP-MS can be a semiquantitative tool for the quantification of these compounds. As additional goal of this work, the efficiency of a gamma irradiation treatment to remove CPS and CPO from apples was tested by analyzing their content before and after the irradiation: 89-99% of CPS and CPO were degraded with doses of 3.5-3.8 kGy and 66-72 h of irradiation per sample. Identical degradation results were obtained by UPLC-PDA and ASAP-MS, indicating that the latter technique is well suitable to rapidly check pesticide degradation in apples.